The Raw crowd in LA was superb. They gave credit where it was due, they were into the show, and really had fun throughout all the matches and promos Monday night. Really, the SmackDown crowd was very good too, but I think Monday night had the better, louder, and more invested crowd this week. I don't have many complaints about Raw's commentary group this week. Byron Saxton didn't say anything too ridiculous, and the group fit together better this week than ever before I think. Where Raw is good, SmackDown is better. I really wish they would've put Corey Graves and Mauro Ranallo on SmackDown together as they would be an amazing duo and I already enjoyed JBL and Michael Cole together. Keep Byron for the three-hour show, and then just have two guys on SmackDown. That would be my ideal fit, but for now SmackDown still reigns supreme here. Monday Night Raw wins here no question. SmackDown really pulled their punches here as they are gearing up for No Mercy. They had no over the top good matches like I'm used to on Tuesday nights. Raw, however, had a fun tag match with Jeri-KO and New Day, and then that incredible main event with Sasha and Charlotte taking over LA for a little while. In terms of matches, I knew Raw would be tough to top for SmackDown, and I was right. This is where it gets a little tough to decide. Both shows had some really great mic work again this week in my opinion. I really thought Ashton Kutcher and Danny Masterson would diminish Raw a little bit as many celebrity guest appearances can be a little weird, but I genuinely enjoyed them on the show. Of course, Jericho is the best promo in the business right now. He along with KO are just amazingly entertaining together and this week was no different. They then added The New Day to that segment, and that made it work even better. It also seemed like all of the backstage interviews and segments just went together very well on Raw. Where Raw has one great promo, SmackDown has two. Miz TV was great again with Dolph Ziggler as that storyline gets better and better, and then the main event promo with John Cena, AJ Styles, and Dean Ambrose was dare I say, phenomenal. SmackDown takes home the win in the promo wars this week. This also is a little tough for me to choose. I'm really digging the storylines on both shows right now. I like the main event scene on SmackDown a little more than Raw even though Owens and Rollins is an incredible feud. Once the Chris Jericho and KO best friendship blows up it'll be even better as I think he'll end up challenging for the title. I think The Miz and Dolph Ziggler storyline makes SmackDown better in this facet. The Miz has been so underrated as a heel for a longtime now, and he is finally getting some time to be himself and its paying off for the blue brand. Again, two hours beats three. Raw filled their three hours much better this week than in weeks prior, but it still feels like some unnecessary things are thrown in just to make sure they hit the three hour time. SmackDown does what they have to do, and it's got a much better feel to it. Monday Night Raw was in LA this week, and I think they pulled out some new tricks when it came t production. I noticed a couple different things on their stage and ramp area. That's enough for me to give Raw the win here. Okay, I have to say it. These Curt Hawkins promo/vignettes the last few weeks have been ungodly awful. Just plain terrible to an extent that I'm finally taking a half a point for wasting so many weeks on that garbage. Also, SmackDown brought back The Spirit Squad. There's another half a point as I think The Spirit Squad is one of the most horrendous things WWE ever spent time with. That would leave us with a tie.. However I'm giving Monday Night Raw one point for doing an amazing thing with their main event. They put the women in the main event for the first time since Trish and Lita on December 6, 2004, and my goodness did Sasha and Charlotte set the bar even higher. Not only for that, but it was an amazing match. It had its botches, yes. So did Trish and Lita if you go back and watch their match from 2004. Charlotte did something I've never seen a woman do in my life watching pro wrestling, and that corkscrew moonsault from the top rope to the floor deserves a standing ovation on its own. Beautiful job by those two ladies, and it closed off a good show. 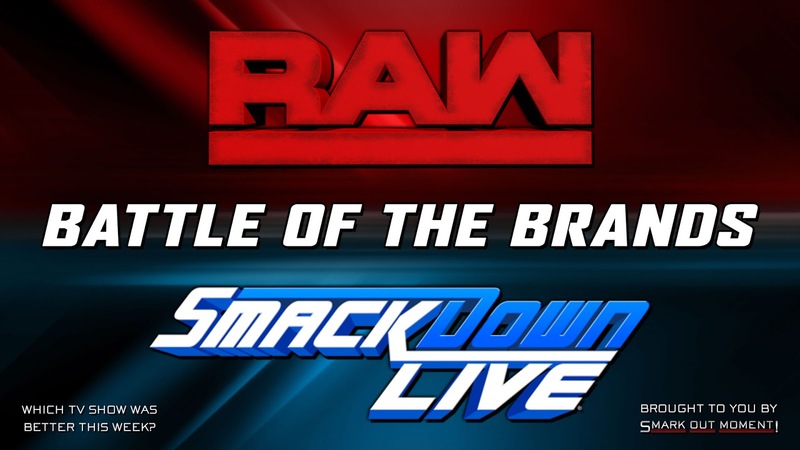 Thanks to the addition and subtraction of the bonus points, Monday Night Raw makes history here on Battle of the Brands winning for the first time ever 4-3. I don't know what it was exactly, but I found myself enjoying Raw more than ever this week. SmackDown wasn't as good because they had to pull back a bit with No Mercy coming up on Sunday, and they played it safe not having anyone from the No Mercy main event participating in a match. Raw took advantage and really had a great show. I believe this makes it 5-1 overall in favor of SmackDown. We all have to start somewhere, and Raw just notched its first win since the brand split.